Patient Comments: Bee and Wasp Sting - Bee or Wasp? My husband was stung by 2 yellow jackets in our backyard, once in the back (through his shirt) and once on the hand. The back sting site is hurting and itchy and has a red swollen 4 inch circle around the sting. The hand sting has swollen his hand somewhat, including fingers, even after 2 days. We're treating with Benadryl and pain medicines. I was stung or bitten 13 years ago. I don't know if it was a bee or wasp, but I suspect a wasp since the pain was so intense. I started having trouble breathing, then lost my vision and then went unconscious. I was in anaphylactic shock. I was saved by paramedics on the scene who gave me epinephrine and Benadryl. When they got to me, my face was gray, eyes rolled backed in my head. My friend thought I was dead, but the medicine saved my life. Two days ago I got stung by a bee, it's been 13 years since the first sting/bite. It felt like just a little "ting". But I brushed it off, maybe I didn't get a full sting. I didn't wait to see what would happen. I called emergency and they came within 5 minutes and gave me injections of Benadryl. I did not go into anaphylactic shock this time. I was so scared I would though, but maybe the prompt treatment helped. I carry an EpiPen since the first time, but I have never had to use it since I haven't been stung except for the sting 2 days ago. While I was weeding this morning I felt a painful sing. I thought I had walked into the point of a palmetto leaf. Eight hours later the spot is still red and hurts. The pain at first shot up and down my leg. My leg still hurts. After researching palmetto shrubs and speaking to my brother who has lived here in Florida for 40 years we are certain it was a wasp. 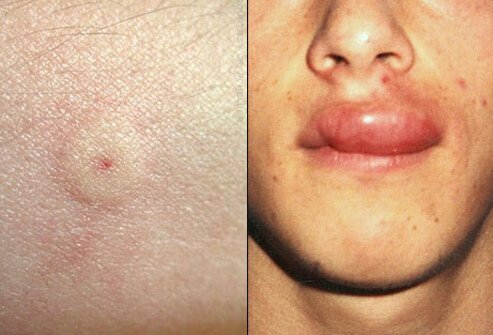 I was attacked by a colony in childhood and am hyper-allergic to any kind of insect sting/bite. I just took an antihistamine. Ouch! I was working in the yard and moved a piece of wood, which disturbed a nest of small yellow jacket wasps. I was stung 11 times on my legs and arms. Two stings were through my nylon shorts. I was treated with an antiseptic lotion and camphor-phonic. I took two 500 mg Tylenol tabs and went to bed. I had no swelling and the next day only minor irritations and itching. I was stung massively by paper wasps in Yellowstone Park in 1976 while driving my motorcycle. Passed out and was unconscious from 3PM 'til 8:30 PM Sunday night. Managed to ride my bike about twenty miles to my campsite in blinding pain with violent muscle spasms. Got to tent and passed out again. Did not regain consciousness until Tues 11:PM. Neighboring camper said there was a welt from a sting every two inches across my back and a lump the size of half a tennis ball on my spine. A puddle of rainwater had formed at the front of my tent and I came to when I rolled over and my face landed in the puddle. It took about a week for the lump to go down, the individual stings hurt like burns for about four days. I hate wasps with a deep and abiding passion now and I always have 2 cans of wasp spray and a bottle of Benadryl handy. I was stung by a wasp on my arm yesterday. It is the second sting in a month. First one ached and throbbed for about 18 hours and was pretty hot for a few hours right afterward. This one hurt when I was stung but didn't hurt at all in minutes so I thought it might have been a baby or a near miss sting. It is now a little more than 24 hours later and the sting area and about a 3" diameter circle is very bright red and very hot and also painful. Can't get my mind off of it and work. I'm not sure if it is power of suggestion but my tongue feels fluffy and throat scratchy. I told a co-worker to watch for me to have an allergic reaction today. I'll take benadryl when I get home. I had no rxn at all in the first 12-14 hours. I was stung by a wasp near my left eye when I was 10. My parents rushed me to the hospital, where the doctors said I was allergic to them. Now I have my husband kill them if I see them anywhere near the house!! Thursday I was at my sisters sitting on her porch when there were a few wasps flying around and all of a sudden I noticed there was a wasp on my ankle bone. Before I knew it, it had bit me and I flicked it off. Immediately I had a burning sensation and applied ice. When I got home, my ankle was killing me and applied ice on and off. The next day I noticed my ankle was red and swollen and have been applying ice packs throughout the day. Today is the 3rd day and still swollen and red and sore. I have tried meat tenderizer, aloe Vera and hydrocortzone cream. At night I take Benadryl. Will this pain and swelling go away. Stung by a black jacket yesterday on the shin. Been stung several times by wasps before with no problems but this time, dead leg feeling, like I've had a cortisone injection, and burning. Hopefully benadryl will help. stung by wasp in back of neck and left ear lobe- swelling has occered. sting @ ear has caused pain in ear and jaw is sore when opening. I was stung on my index finger. My finger at the sting site swelled considerably and the tissue became both very sensitive and numb. The numb feeling persisted for days along with the swelling and pain. I can't believe a bee sting is that strong. Share tips and suggestions for preventing a bee or wasp sting.